Performance Air Service is certified for design and installation of Mitsubishi Multizone systems. The City Multi is the perfect solution when a building is maxed out of its air conditioning and space is limited for adding new air conditioning. 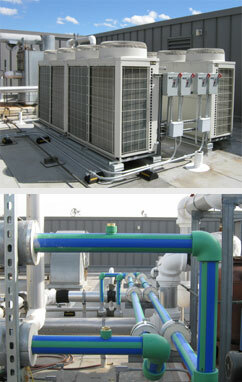 Performance Air Service has certified Technicians to install Aquatherm products. Greenpipe is a excellent alternative to grooved pipe due to less leaks, and less scaling. Also, shorter install time of Aquatherm helps any project where there are time constraints. Contact us to see how much we have to offer.